No-tech tanks.. anybody out there doing this? Thread: No-tech tanks.. anybody out there doing this? Any body running NO-tech tanks out there? Or am I nuts? No filter, no heater, no nothing. Just sunlight or a desklamp? I did tanks like this back in the day and those were my favorite tanks.. CPO's bred like crazy in those tanks. Anywoo, my new tank is this way, going to get my 10g setup soon this way. I guess in a way they are heated by my central air. If you count that. I have 1 tank setup like this and it is still running. Here is the old thread. Since then it is now completely NO-tech, it is just sitting on the kitchen counter. Only thing I do is top off and feed when I remember to. Photo from this past Monday. I actually have two no-tech bowls with your basic red cherry shrimps. 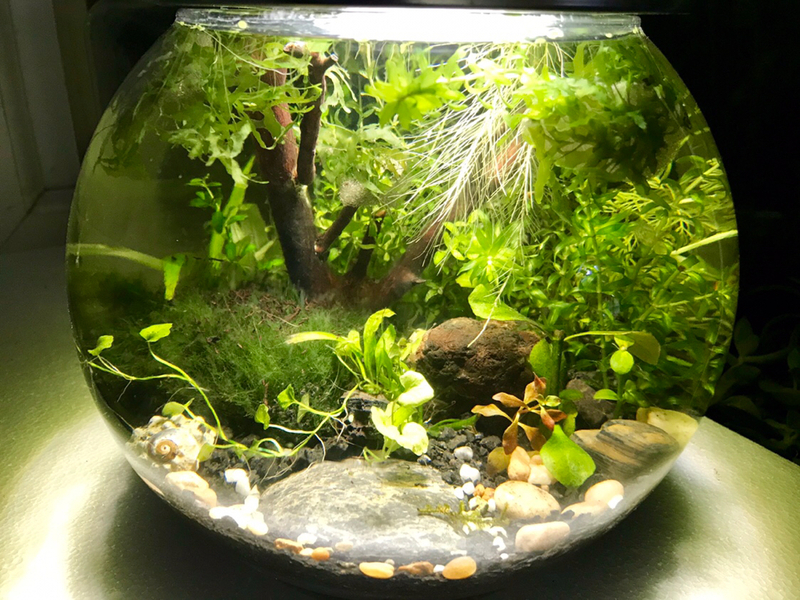 I have one 1.5-2 gallon size shrimp bowl with plants and moss that's been set up for over 6 months now. The other is a 1 gallon that I just set up for a co-worker about a week ago. I have two perfect windows for indirect sunlight that I place them. I'll post pictures later on. It's really cool because there is no electrical equipment in use. The temps stays relatively stable in both areas. I do top offs and the occasional 20% water change. Oh yeah, and some trimming here and there. used to have a 60 gallon long like that with koi/goldfish like 15 years ago. had the water all low. had a bunch of floating plants and made sure the bottom was covered in algae. never had a problem fish was thriving. was an outdoor tank. Over the years, I've done multiple no tech tanks, sunlight, water, ferts. 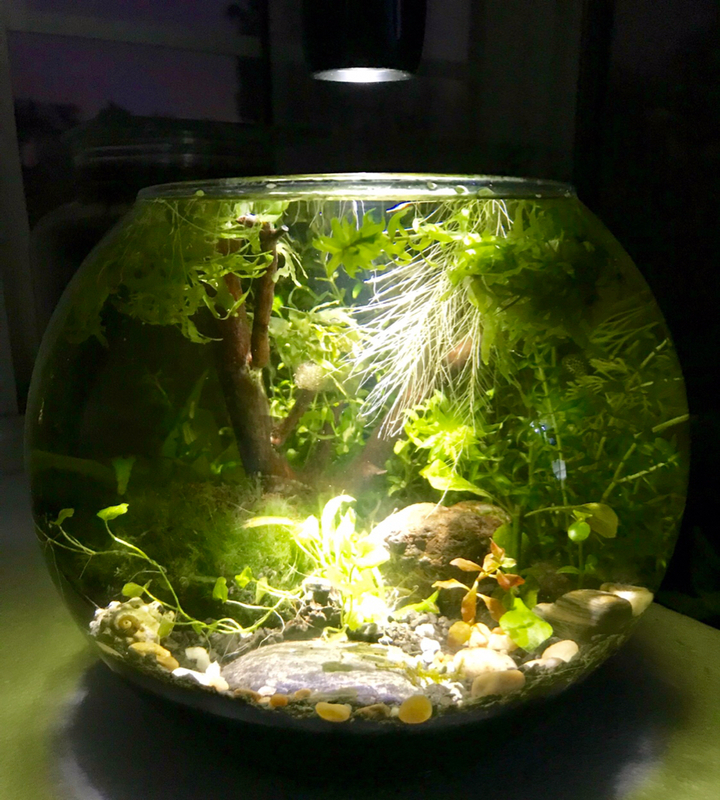 From a Tupperware container all the way up to a 125G shallow pond tank until I took it down a couple months ago, had it running successfully for 5 years. Bowl #1 with red cherries and a jungle inside with moss and stem plants that totally need trimming. Bowl #2 just did this one over a week ago. Been sitting in front of a window with indirect light. For pic I’m holding a flash light for illumination. I have 3 no tech bubble vases and 2 of them have just heater because of the fish. I don't really do water change on any of my tank but rather topping off here and there to keep up the water level. How did you attach that maiden fern to the driftwood. 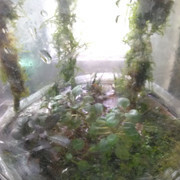 I am planning to do a paludarium. 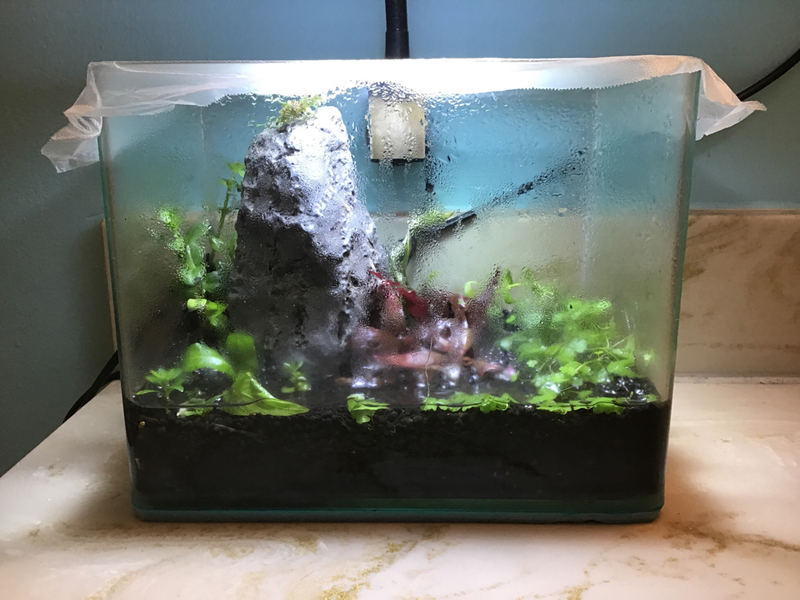 This is great timing- I just stared a 1 gallon cube with a few random trimmings and was wondering if it could go with no filtration since even a sponge filter would take up too much space. It would be awesome to keep some cherries in it. 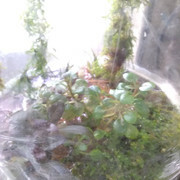 I bunched up some soil mix, wrapped it with moss and wrapped it again with nylon mesh (the bath scrunchies used to scrub yourself with soap, I think that is what they are called). Tied it to the wood and inserted pieces of plants. 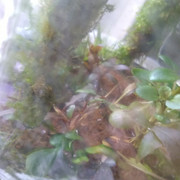 The fern is the only one that didn't eventually dry out, I had a few other plants there as well. 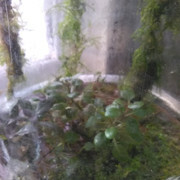 I'm eventually looking to do a paludarium as well. Post some pics and show the progress. @geektom This a nice piece of rock there. Sure I will update it here. Awww yeeeea. This is what I'm talking about. I have enough noise and wire spaghetti in my life. I think my future is going to be all this. Even the large tanks. 24/7 central heat makes things a little easier too. I have two no tech tanks. A 1.5 gallon that I set up a month ago and plan to get some shrimp for it. My other tank is a 6 gallon cylinder tank that I have had for 10 years with some Anubis, java fern and manzanita. Unfortunately it is no longer no tech cause I had to add a heater for my betta this winter because the temp dropped to below 60 and he was not happy. I remember asking someone at the local fish store about making a no tech tank when I first wanted to set it up and they thought I was crazy. Sunlight and a touch of glut. I am working in some jars right now. I haven't done anything but put substrate in them so far. When people visit my place and look at my tank, they do a double take. They ask me "wheres the filter?" and I know they are thinking in their head *oh my gosh, those fish are done for. * They are still doing fine though.. we will see as time goes on. That jungle cherry bowl is just like my cray cube was. Except round. That is still my all time favorite tank I have ever had. I was running my dirted 55gal with just a light. The light failed and a day or two later the whole thing crashed. I bought a new filter and light after that but it was running great with just a light. I think its the ratio of plants / animals that determines if it will work.